Big ideas are often found in startup offices. As the goal of most new businesses is to quickly begin to generate a profit, entrepreneurs try to save cash by keeping rents low and office furniture costs to a minimum. This is a good philosophy but offices with limited space require small office furniture that is designed to be comfortable and attractive. Conference rooms tend to be tight with small round conference tables surrounded by 4 to 6 chairs. This makes presenting big ideas to other companies difficult, as seating for a presentation is limited. There is a solution, purchase attractive and affordable stacking chairs that can be stored in a corner of a conference room, lobby or elsewhere. 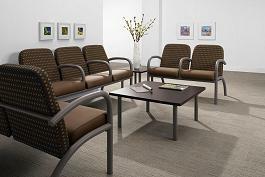 Browse the office chairs we offer to find a large selection from big and tall, lobby, even kids waiting room furniture. All of our office chairs are competitively priced and include free shipping. Many chairs can be modified with materials, colors, sizes and more options. Contact our expert personnel learn more about our line of small office furniture to find the perfect fit for your work space.